Gerard Philipe plays the title character, Russian prince Myshkin, who returns to St. Petersburg after a stay in a Swiss mental hospital. The Prince is not literally a mental midget; he is considered an idiot because, as an honest and upright person, he cannot keep pace with the evil in the world. He busies himself with the petty problems of his aristocratic friends, which drive him back into the recesses of insanity. 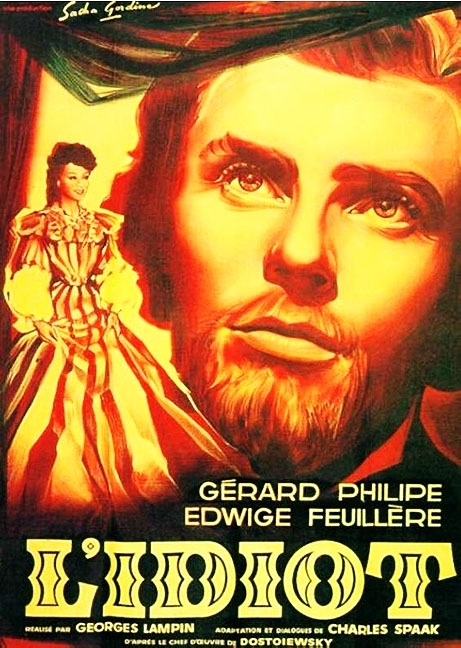 Edwige Feuillere costars as Nastasia, the woman of loose morals who turns out to be the only person who truly cares about Myshkin's welfare, while Lucien Coedel plays the nominal villain of the piece, an iconoclastic flour merchant named Rogozhin, whose passion for Nastasia culminates in tragedy. A necessarily condensed and simplified version of a complex novel, this film is still a worthwhile adaptation due the performances of its two stars; Edwige Feuilliere and Gerard Phillipe. so important for one whose French is rudimentary at best.